An employee checks the quality of the lumber at Wold River Lumber, a sawmill in New London, WI. Located in New London, WI, Wolf River Lumber has five sawmills and produces premium northern hardwood lumber, and is an FSC-certified supplier for a number of species, including: walnut, cherry, birch and maple. On the 55-acre site, the company has 40 dry kilns, with a drying capacity of 5 MBF per month, and walnut, cherry and beech steaming facilities. Also on this site, Wolf River produces ripped and cut-to-size dimension lumber. 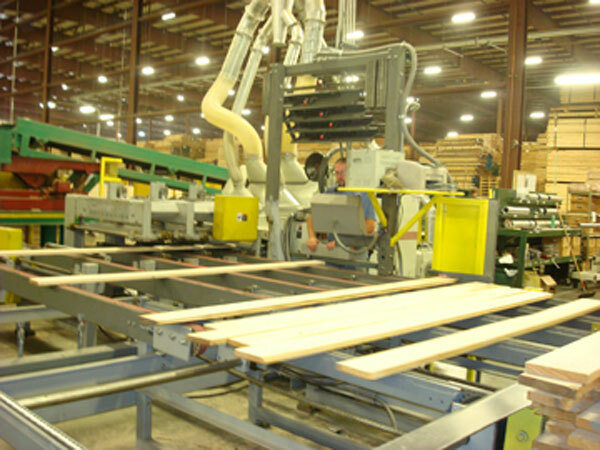 The company uses lean manufacturing throughout the estimated 286,000-square-foot plant to produce ripped and cut-to-size dimension lumber. On the fully automated Green line is an Ultimizer saw and a Newman short stock machine knife planer, which feeds into an abrasive sander. From there, the lumber moves onto the Grading line and is sorted into carts by grade, color, width and length. “We have [the capability for] 100 sorts — 50 carts on each side,” explained Gary Ort, president. After sorting, further machining may be done on the Mereen-Johnson ripsaw, which is used in conjunction with a Cameron Automation Opti-Rip System. In addition to being FSC certified, the company has a number of sustainable initiatives, including generating power from a biomass unit on the site. Wolf River Lumber is a seventh-generation company. Watch a video of the grading line.